THE 13th Amendment to the constitution has prohibited slavery and indentured servitude in America since 1865. The one exception is as “punishment for crime”. As a result, prisons use their inmates as forced labour to balance the books, particularly since private firms were allowed to hire them again in 1979. Last year around a third of America’s prison population of 2.3m worked. Most of this labour is done for much less than the federal minimum wage of $7.25. According to the Prison Policy Imitative, an advocacy group, some prisoners working in industry earn as little as five cents an hour. 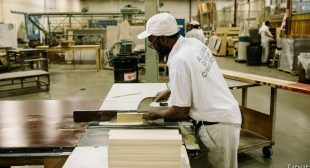 Regular prison chores are unpaid in Alabama, Arkansas, Florida, Georgia, South Carolina and Texas. Many worry about the impact on local labour markets of undercutting free wage rates.